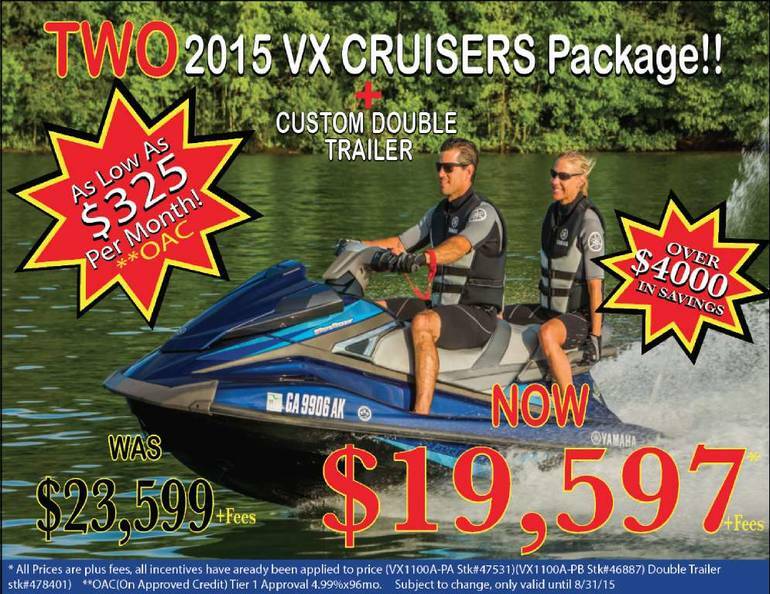 2015 Yamaha VX Cruiser, HUGE DEAL GOING ON NOW! TWO WATERCRAFTS PLUS A TRAILER! HURRY! - All-new in 2015, the VX Cruiser is the ultimate entry-level watercraft for first time buyers who want the best overall value in the industry. A wider platform, a redesigned NanoXcel hull and deck, and Yamaha's patented RiDE technology combine to create a stable ride. Additional upgrades include Cruise Assist/No Wake Mode and Yamaha's innovative cruiser seat for comfortable, three-up riding. All Yamaha pictures are kind of Yamaha HD motorcycles picture was taken, including motor fuel gauge, engine, engine mounts, tires, fuel tank, the car handles, lights and so on, 2015 Yamaha VX Cruiser full-screen viewing,2015 Yamaha Motorcycles today Price: $19,597 .